It's time for Met. Monday hosted by the gracious Susan @ Between Naps On The Porch. Be sure to visit her blog to see all the wonderful things everyone has been up to. You will find tons of inspiration and eye candy. Today I am so thrilled because my very dear friend Kathysue has agreed to do a guest blog showing some of the rooms in her home and how she changes them for the seasons. If you've visited RMS you've probably seen some of these rooms, and you may remember her master bath that was #1 all time favorite ever. It is stunning as well as the rest of her home. You will love her place and the changes she makes. Hi fellow bloggers, I would like to thank my dear friend Marty for inviting me to do a guest post on her blog. This is my very first attempt, so bear with me........... I love to make changes in my home for the seasons so Marty thought Met. Monday would be a perfect time to show you how I do that. First I will show you some pictures of my fall/winter look. You will see that I use touches of black and white in my green kitchen. I love the warmth that this color combination gives me in the cold weather.Here is my dining room with the warm glow of lamps and a green pumpkin surrounded by white winter berries(sorry no orange is allowed in my house). 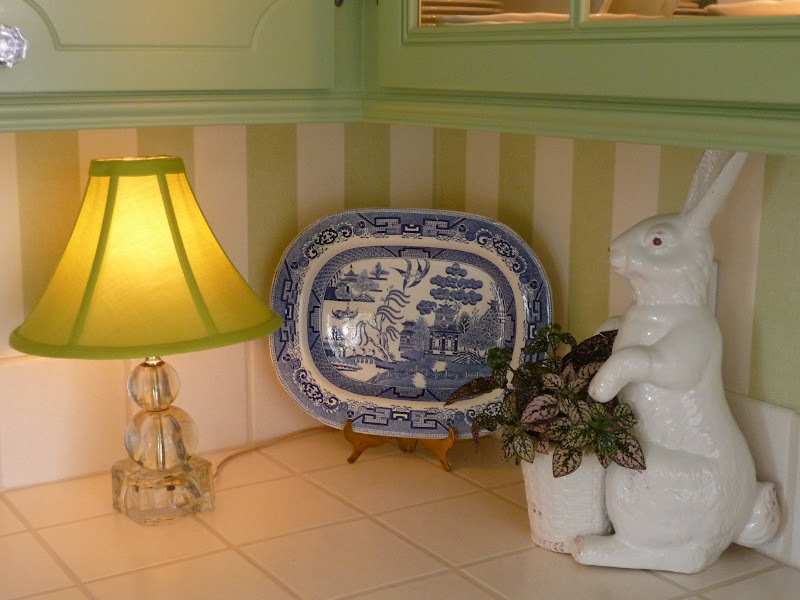 This next picture shows the corner of my kitchen with a little accent lamp which just seems to work for all seasons. 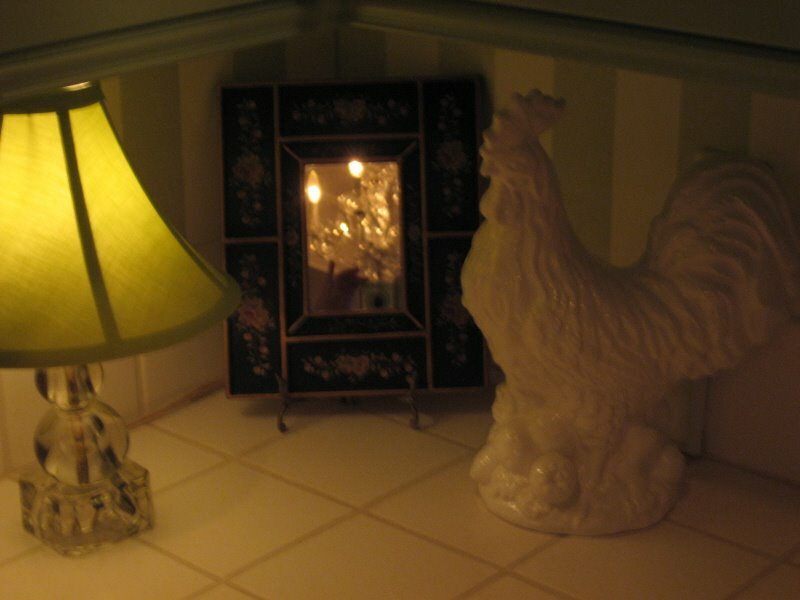 I use a black mirror to reflect light and the white Rooster is for a little whimsey. Inside my cupboards I use black and white transferware. It is always a classic in my book and perfect for the fall and winter months. Now you are about to see my Spring look. I actually have two looks for you. The first is an all white that just feels light and airy after the cold months of fall and winter. This is my pink and white look.Now who doesn't think of pink for Spring when all the flowers are blooming outside. I look at this it just makes me smile. Are you starting to see, you don't have to change the world to get a new look. Just with adjusting a few things Voila' a whole new look. I have added some clear blue glasses to my white dishes and one blue and white floral covered dish. Not an earth shaking transformation but it still gives me a cooler feel for summer. 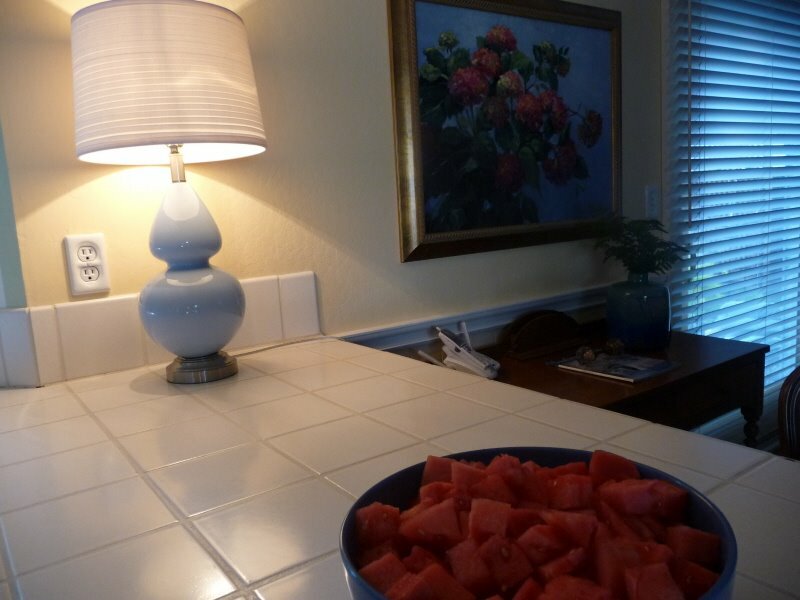 Here is a blue bowl full or ice cold watermelon, after we polish this off I will change its contents with an abundance of lemons and limes for my cool summer drinks.You will notice the blue gourd shaped lamp. I know it is a bit contemporary for my rather traditional home but I love the color and the shape. It is my nod to Christopher Spitzmiller, without the price tag. Are you beginning to see how easy this all can be? Finally the Summer dining room. The lamps have been replaced with ferns that grow in the shade.I have added a blue tablecloth as a backdrop for varying sizes of blue and white containers. 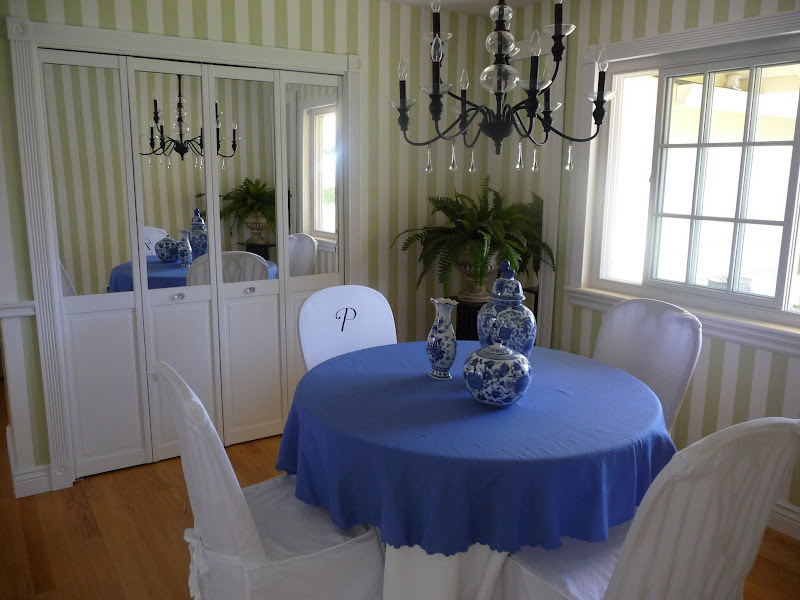 Did you notice how she used mirrors on the doors in the dining area and by the window in there too. 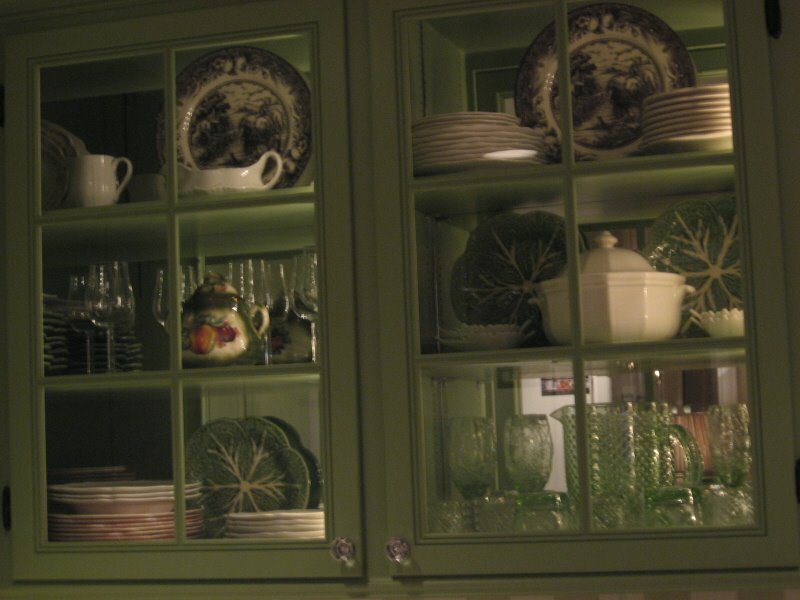 Also how she used mirrors in the cabinets in the kitchen. It really reflects her decorations and the light and makes the spaces seem even larger. I love how they just seem to be part of the architecture without screaming mirrors. Just another one of her many decorator tricks and touches. Kathysue, I am so thrilled to have you do a guest post. Your home is just gorgeous and I know everyone got to see a ton of eye candy and some great inspiration. Love ya'. Hi Marty and Kathysue, Oh I love to see all these tricks for decorating for the different seasons. They each look so different and it would be hard for me to pick a favorite. Thanks so much for sharing and both of you have a great week. Oh my gosh, I think I just ruined my keyboard by drooling all over it. Great post gals, thanks for sharing and wow what inspiring pictures! I love the stripes! AND the green! I never would have thought that it could be so versatile. Just beautiful! Kathysue, your home is beautiful! Thank you for sharing these lovely photos! Thank you Marty, for Kathysue's guest appearance! Yep, I was thinking right away: good use of mirrors to make the space seem bigger without screaming mirrors! Marty, we do think alike. 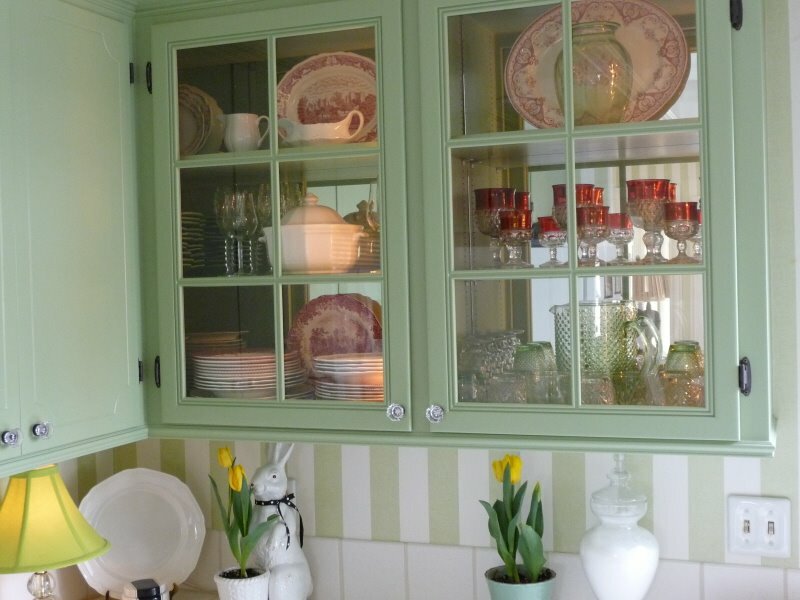 I absolutely love those green cabinets. So cool and crisp. Another thing that grabbed me right away is the use of small lamps in the kitchen. I have said this over and over. Use small lamps in the kitchen, folks! It looks far less sterile and more intimate! I just love this. Does Kathysue not have a blog? Well, if not she needs one to help us all out! I really enjoyed seeing how you change things up seasonally. It's something I try to work on all the time so I keep "seeing" the whole room. But I do get stuck a lot. I love your color combinations and your mix of whimsy & classic. Your decor is fabulous! Marty, you are a doll!! Thanks for inviting Kathysue over. Try to talk her into showing us more!! Wow, what a wonderful guest post! I love the different looks for different seasons. I have never really done that in my house, but now I am getting some good ideas. I love her kitchen cabinets too. We are getting ready to do some new cabinet doors,and I love the glass doors. Thanks for all the great inspiration! I remember seeing this kitchen and dining area on RMS - and thinking it was the most charming kitchen I had ever seen - and now...even more so! Thanks for the share. This is a beautiful dining room. How pretty that you change it for the seasons. Thanks for the sharing. Hi Marty and Kathysue ! Great idea to post together....I love the season changes through the glass...now I want to add more glass to my cupboards....LOL ! 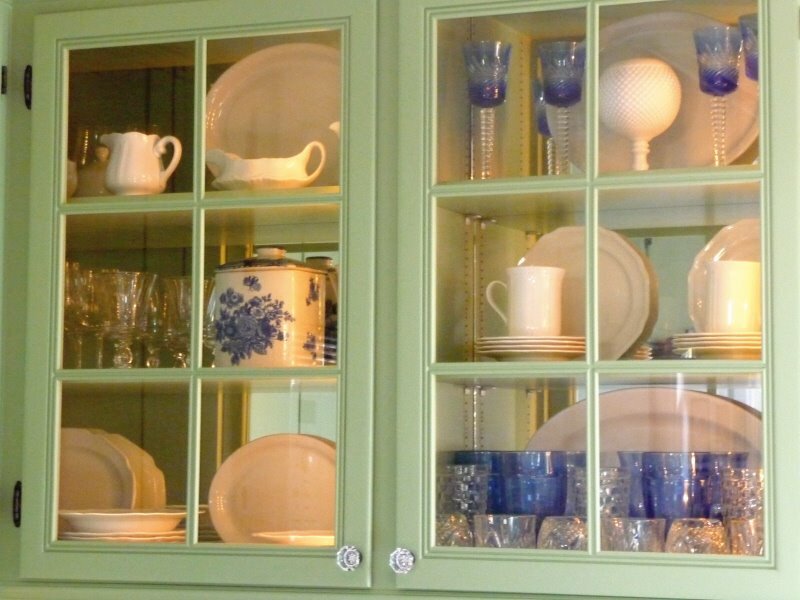 That is so beautiful ... Love the green cabinets and the blue table and ... everything else!! Wow Marty!!!! I love Kathsue!!! what a great post and what a beautiful home!!!! keep these post coming!!! Kathysue, your room is beautiful, each and every seasonal change is absolutely gorgeous! you have a very keen eye. Hi Marty! What fun to have a guest blogger and what beauty she brought! It all looks good! Fun post, Marty! It is a beautiful new look with just minor changes!!! You certainly have a knack for decorating! I love all the looks and hope to see more!!! Great job, and congratulations on your first post! What a fun post. It's great to see seasonal decorating! Great post idea Marty, thanks for sharing kathysue with us! I enjoyed Kathysue's beautiful home so much. She is right...change is good. Great ideas and beautiful pieces put together so elegantly. Great guest post. Marty and Kathysue...Great post! It's amazing how just some small and simple changes really does make the room look different for each season! I truly enjoyed! Huggy Hugs! Morning Marty and Kathy Sue, What a beautiful home and great ideas for changing seasonal looks. I love the round table and chairs with the covers and the initial P.
Thanks for letting us come in and share your gorgeous home. What a great friend you have Marty. Happy Monday and thanks for color suggestions. Sua casa é um sonho. Your home is a dream. Thanks Marty for having Kathysue guest post. I came away with specific concreate ideas for my own home. Isn't that what we want from these decorating posts. Kathysue, you absolutely need your own blog, too. To both of you, thanks for sharing. What a beautiful house KathySue has! I enjoyed seeing the different versions! Wow - this was really inspiring. I loved all the different looks. That just goes to show that if you pick a color (like green) you can still change it up. I'm in love with KathySue's transferware - all of it. Very nice! 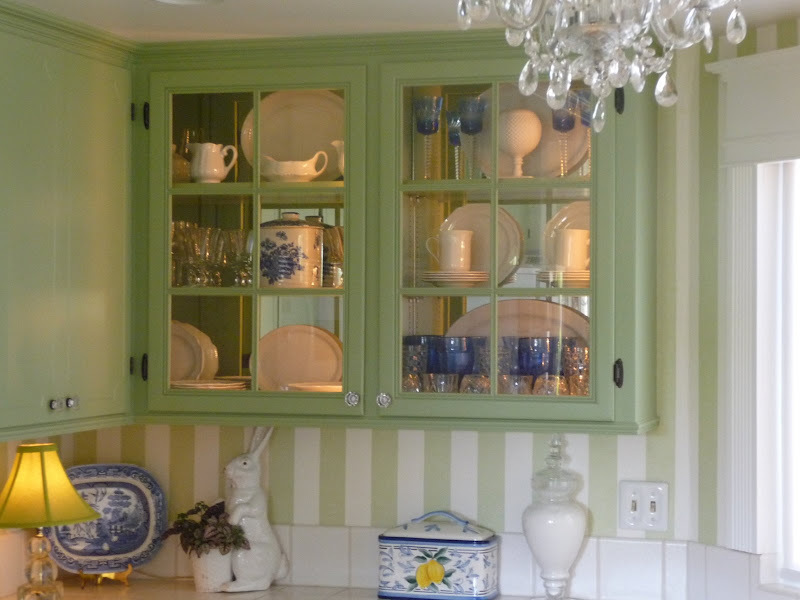 What fun to see more pics of your beautiful diningroom and kitchen, Kathysue! You have such great taste. HOpe you are doing well & having a great summer. Don't be a stranger! Hi Marty and Kathysue! What a beautiful dining area and kitchen. Your changes make the seasons come alive! I would sure love to see some of your Christmas decorating Kathysue, I'll bet it is jawdropping right along with Marty's! Beautiful! Of course, the blue is my favorite. Oh, Marty! Thanks for hosting Kathysue's lovely home! I remember some of these pictures from RMS, don't I? 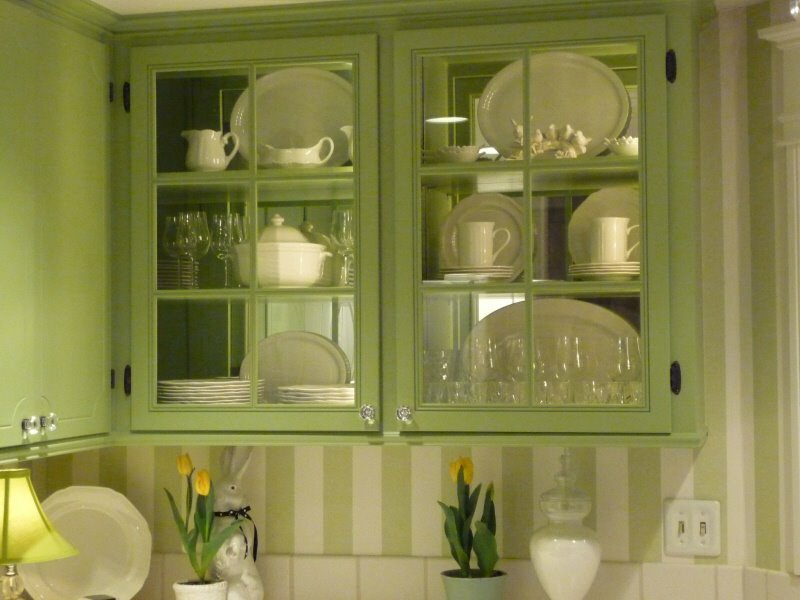 I remember the beautiful green kitchen cabinets, I'm just sure I did! Thanks for popping in and have a beautiful day! Wow - what a lovely kitchen!! I think I remember some of your other posts from RMS - maybe a bathroom (that made the front page maybe??) and bedroom? Anyway, love the colors and the way you change them out seasonally - that makes such an impact! Marty - what a way to add a fun post to Met Monday! Thanks for stopping in today. Very impressive post! Thanks for sharing such inspiring images! Marty, thank you for always leaving such gracious, thoughtful comments you visit my new blog. They are invariably "day makers." P.S. Those antique Noritake plates you found at GW are amazing -- what a find! Hi Marty and Kathysue! Love this post, everything looks so nice! How about you both visiting my house? LOL! Congrats too on your celebrity visit from Eddie Ross! Hi Marty and Kathysue, this is just delightful.....I love it all. Thanks so much for sharing with us. Great guest Marty! I love the colors! I had to laugh at the orange, for yesterday after 31 years, as I was making a blog for hubby he said his favorite color was orange. I thought it was blue! lol Well that his second one. I see my black transferware. I see some lovely blue pieces I want!lol I do remember these doors! They look wonderful I know I been on your blog now! Where did you go? Your home is lovely! Wonderful idea! I usually only change my Mater Bedroom bedding... for the seasons... I should branch out to the whole house! Hi Marty! What a great post. Love looking at all those dishes in the cupboards. What is it about women that they love to look at stacked dishes? My hubby confessed he likes the look of stacked....hay! hahahaha. Hope your day is beautiful. Love the color transformation and those slipcovers with initials are too cute! Thanks so much for sharing this with us, Marty! Kathysue, you have a gorgeous home! Kathysue, this was so much fun. I love how you transformed your dining room with just small touches. 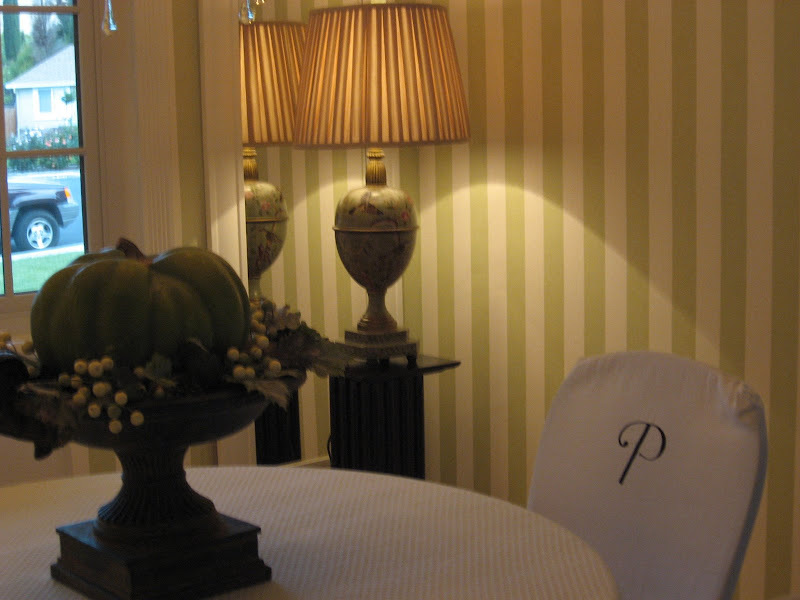 Love your striped wall paper. What a wonderful and inviting space! I LOVE the stripes! Do I ever remember kathysue's kitchen, one of my all time favorites. Thanks for sharing with us yet again. What a gorgeous home! I love the mirrors. I too collect red transferware. BEAUTIFUL!! I LOVE the color of the cabinets and I can't even decide which one I love the best! I love them all! Kathysue what a beautiful home! It inspires me to think about mixing things up for a fresh look. Even though our seasons don't change much, I still can remix the things I have for whole new feeling. These photos are wonderful. Thanks Marty for introducing us to this talented lady. Loved the guest post. Kathysue really knows how to decorate. I love everything. Great post. Thanks for sharing your different themes. I love the mirror counter. You do have a beautiful home. Your room is fantastic. You've done a great job with colors and textures... 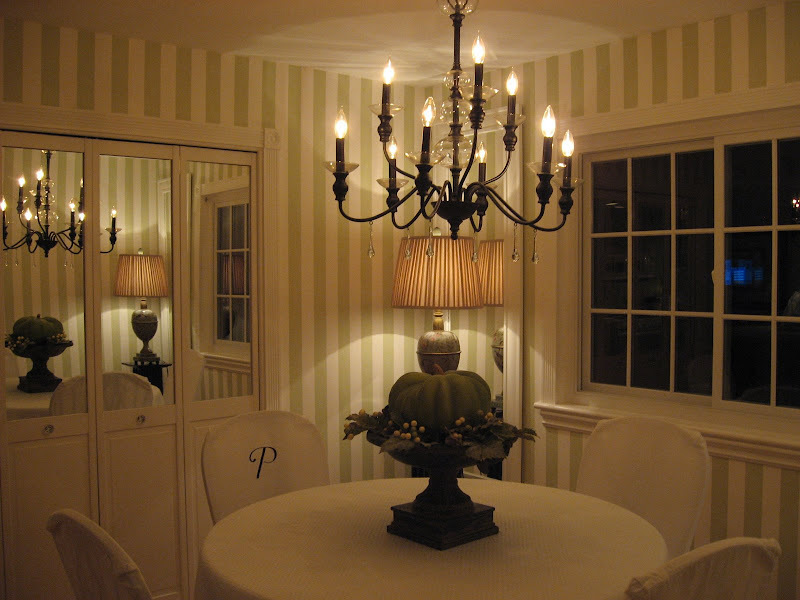 I especially loved the striped walls! Blessings to you and yours dear Marty! Ohhh Marty...what a fabulous idea...having Kathysue guest host about the seasonal changes that she makes in her home!!! You know, I'm so glad that you asked Kathysue to share her home with us...specifically her kitchen! It is my "all time" favorite kitchen!!! I remember when she first posted it on RMS...it was breathtaking!!! Every time I see it...I just think and feel a "breath of fresh air"! 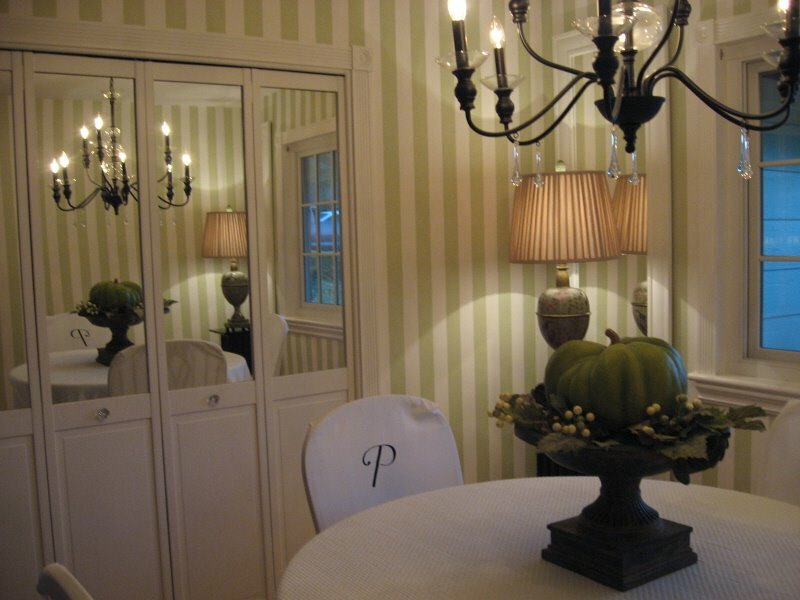 I just love that color of green on the cabinets and Ooooh...that fabulous dining room!!! It just simply amazes me how changing out just a few items can make such a huge design difference...lending an entirely different feel to the room!!! Sure wished you could of heard all of my Oooohs and Aaaahhhs!!! Each time I looked at the seasonal decor...I thought, this is my favorite...that is until I seen the next season's changes! hehe!!! But then, Kathysue is such a talented designer and she just makes it all look great!!! I remember seeing some of these changes on RMS, however I had never seen the cool blue's of summer! Ohhhh...I do love the look of the blues with that pretty shade of green...it's fabulous!!! Marty...thank you so much! This was a grand idea and so much fun!!! Thanks for stopping by and entering my giveaway. I'll announce the winner on Tuesday. Beautiful! I love to change my dishes for the seasons too so it was so much fun to see that someone else does too! I love those stiped walls too! Marty, thanks to both you and Kathysue for a peek into a portion of your friend's home. It is amazing what just changing a few things around can do to create a new look. I really enjoyed this post and seeing Kathysue's accessories and rooms. Thanks! Come again! Hi Marty and I appreciate your visits so much! Thank you for saying just the right things! Definitely beautiful. Very much a home. Just stopping by to say hello and to tell you that I got your sweet note that you left on my Christmas dishes post...thank you so much for the sweet comments, my friend! Hope that you're having a terrific Tuesday! PS...Plus coming by gives me a second chance to look through Kathysue's fabulous home again...hehe!!! okay Marty...I think you'd best get the guest bedroom ready...I need to come live there! How pretty is your house! Wow what a special treat! Everything looks so amazing. Thank you for sharing with us. Hi Marty and Kathysue, What a gorgeous post. 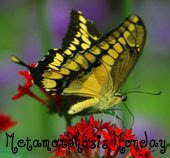 I love all the seasonal changes your home is beautiful and so inspiring, happy Wednesday to you both, Kathy. Marty, It is postively breathtaking! I LOVE it! I love the colors! Isn't that just awesome? What a beautiful kitchen. This room makes me take a deep contented sigh. I love the different, seasonal looks. My fave? The clean white takes 1st place!